Sichuan is located in the upper reach of the Yangtze River and the hinterland of Southwest China. It is bordered by Hubei and Hunan in the east, Guizhou and Yunnan in the south, Xizang (Tibet) in the west and Qinghai, Gansu and Shanxi in the north. The name Sichuan means four rivers and it refers to the four most important tributaries to the Yangtze River: Minjiang, Tuojiang, Fujiang and Jialing Jiang which flow through the province from north to south. The mountainous, misty Sichuan Province, also known as “The Land of Abundance”, is one of the birthplaces of Chinese civilization, and home to numerous anomalies, ancient mysteries, cryptozoology, and paranormal phenomena. 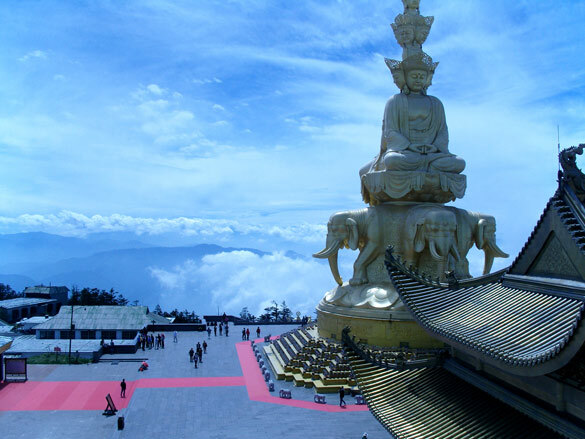 Only an hour away from Changdu, the province capital, is one of China’s most sacred mountains, O-Mei (also known as Emei Shan). 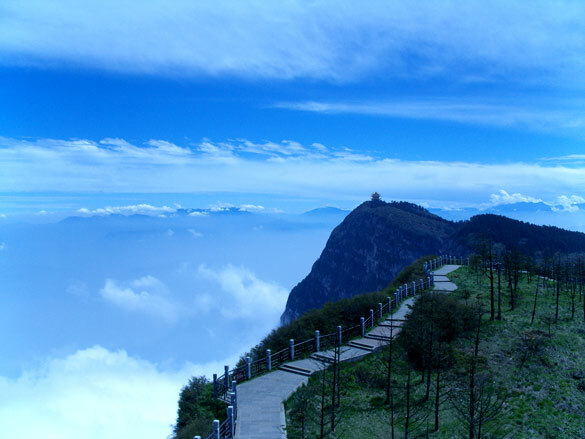 Inhabited more than 5,000 years ago, Emei Shan is rich in history and culture. It is the most famous and highest of the Four Sacred Buddhist Mountains of China, rising to 10,103 feet with some 76 monasteries. The province also hosts Xichang Space Center, Rocket and Launch Center, an important part of Beijing’s program to reach the stars. Throughout recorded history China has been the home to some of the most culturally and technologically advanced societies on our planet. The past, present, and future come together in Sichuan. One of the largest provinces of China, Sichuan has had its share of UFO sightings. Unidentified flying objects have visited China since the distant past. Some observations have been recorded in the annals of the country’s history. Red China lifted the ban on reporting UFO sightings in 1979, ten years before its neighbor and rival to the north, the Soviet Union. But many observations are fairly recent. Let us look at some strange objects in the skies over Sichuan. Zhang Zhousheng, a former astronomer at the Yunnan Observatory first observed a UFO in Sichuan in 1977. Mikhail Gershtein, Russia’s top UFO researcher and well-known author of numerous books on the subject, has collected information about Zhang’s 1977 sighting. He mentions the sighting in his book Chto skrivayut ufologi , in English What is covered up by ufologists (Moscow, 2006). The sighting took place on July 26, 1977, in the northern section of Chengdu. 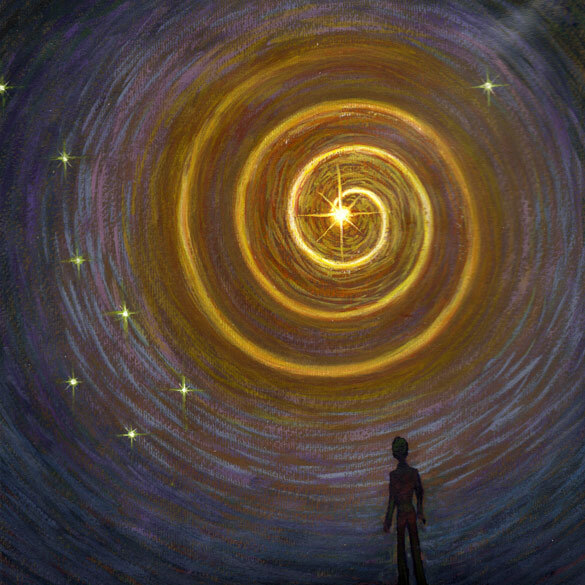 Zhang observed a strange spiral-shaped object, and pointed it out to other people. The object was shaped like a sphere that resembled a yellowish star. A large Archimedes spiral emitted from the sphere in a glimmering line, clearly bright in the moonlight. The color of the line was blue and partly green. Because the spiral line emitted from the sphere, it was clearly not as star. It was a probably a relatively small object. The line went around it in three to four coils. The strange object also moved in the sky in straight line. The velocity was invariable, about ten degrees a minute. The spiral moved synchronically with the sphere. The size, shape, and luminosity of the object did not change, and the spiral did not rotate around the sphere. No trails were left behind in the sky by the object. At 10:14 pm the spiral disappeared behind the clouds at the altitude of 10 degrees. The sighting lasted about five minutes. The Chinese scientist was shocked by what he had seen. Illustration of July 26, 1977 UFO sighting. The astronomer made a prediction in June, 1981, that in July of the same year there would be sightings of a UFO. On July 24, 1981, millions of people in Gansu, Qinghai, Sichuan and Yunnan Province actually saw a flying luminous spiral-shaped body appear in the sky. Zhang claimed that he was able to calculate the arrival of UFOs. Having been engaged in the study of UFOs ever since 1977, Zhang has also explained his ability to predict arrival of UFOs. 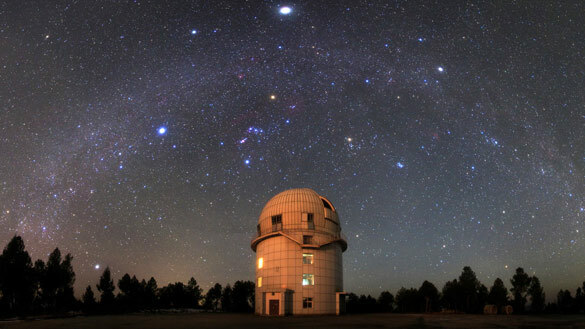 According to him, UFO prediction is different from meteor showers; he can predict when a UFO comes, but cannot be sure they are in the right location where we can see them. Zhang also claims that he knows more than anyone else in the world about such predictions. His predictions have been reported in the Chinese media. The 1981 spiral UFO had an altitude of about 650 km, and a speed of about 1.6 kilometers per second before it disappeared, according to Professor Wang Sichao, a planetary astronomer at the Purple Hills Observatory of the Chinese Academy of Sciences. Professor Sichao believes extraterrestrial beings do exist and their UFOs have the ability to visit our Earth. Another Chinese astronomer and a dedicated UFO researcher Wang Sichao was interviewed by The Yangtse Evening Post on July 1st, 2002. 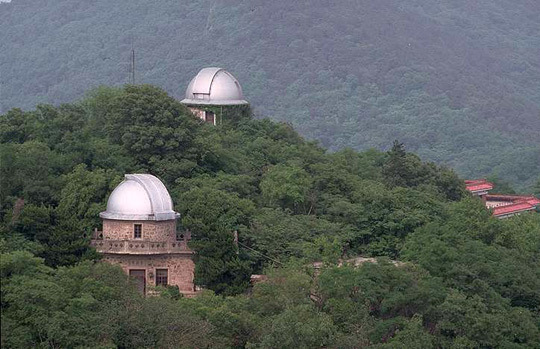 Having analyzed the descriptions of the witnesses’ accounts, he concluded that the 1981 UFO was a “dimensional flying machine.” Such phenomena had been observed before; he and his colleagues at the Nanjing Zijinshan Astronomical Observatory have recorded, gathered, and analyzed UFO incidents since 1971. Such “dimensional machines” have been observed dozens of times. Mr. Wang believes that the UFO is of intelligent design and not a natural phenomenon. After the 1981 sighting, Chinese researchers studied ancient chronicles to find analogous events, and found over thirty references to “bent arrows” in the sky and other similar anomalies. 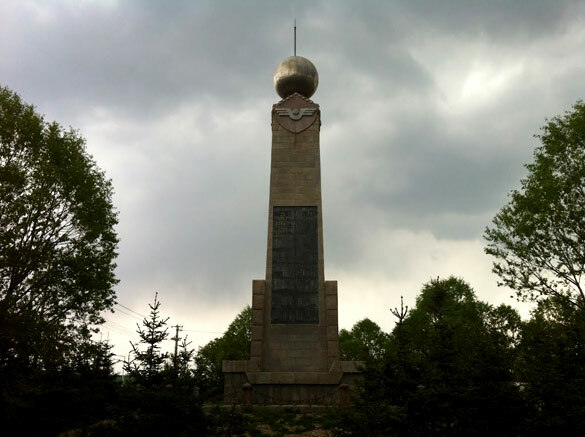 In 1987, reports of a number of reddish spheres flying over Sichuan circulated in the West. Soviet sources had more information about the sighting. According to Izvestiya newspaper, March 20, 1987, an orange-colored UFO appeared at the altitude of one kilometer over Sichuan Its shape was that of a straw hat. The UFO disappeared in half an hour. There were twenty eyewitnesses; one recalled that the object made strange noises. There were many reports of UFOs throughout China in December and January, 1999. Chinese military scientists had revealed to unnamed sources that there were tests of a new stealth fighter conducted in the north, east, and south of their nation. 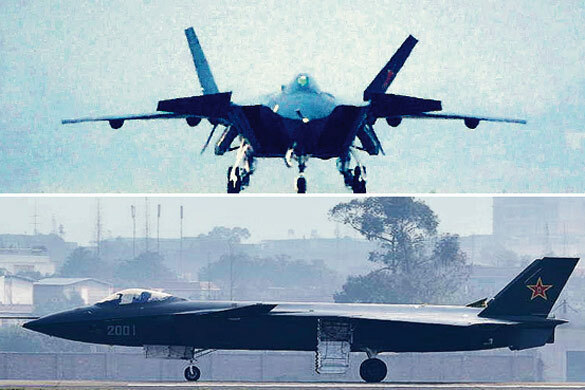 But the first tests of the Chinese stealth fighter Kong Shiji yihao were conducted in southwestern China in May, 1998. 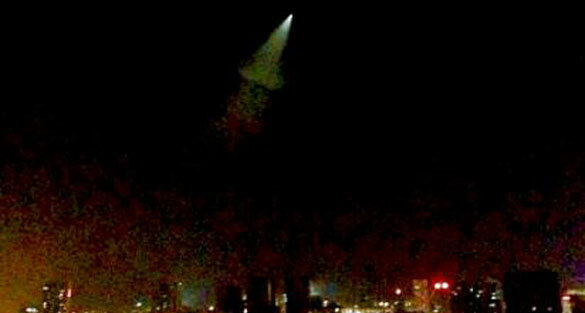 Numerous cities in Sichuan province reported seeing a ray of light from a UFO. Chinese military sources alleged that when the light is seen, the aircraft takes about 5 – 6 minutes to pass from view, so it was traveling at about 200 kilometers per hour. The new aircraft was to go into service in 2005, according to Beijing Scene (January 1999). Something very interesting flew over China’s three provinces including Sichuan in June of 2002. 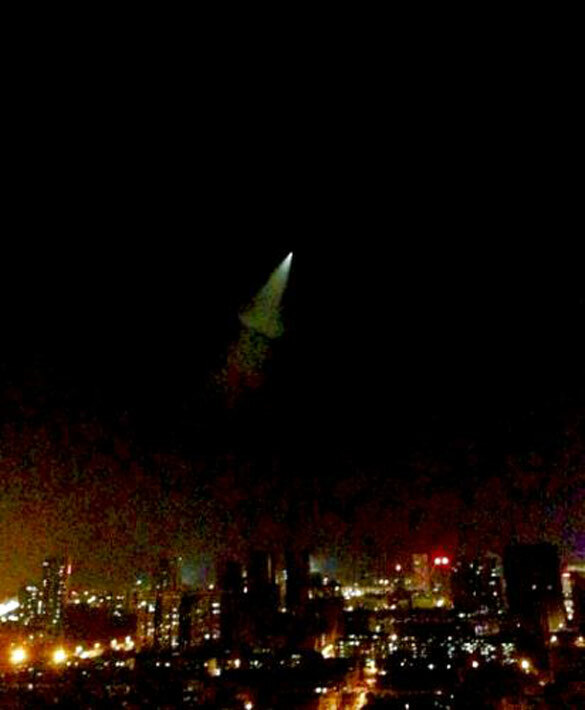 As reported by several media sources, on June 30, around 10 p.m., a mysterious, light-emitting, shape-changing object was observed in the nation’s sky (Shanghai Star of July 3, 2002; The Huashan Post, The Tianfu Morning Post, Henan Morning Post and more). The accounts described an orange and white ray of light appearing in the sky. The ray flew from east to west, and was visible for about three minutes. Its size was approximately that of a desk, and it changed its shape from a fang-shaped object to a fan-like one. The various witnesses’ reports of the shape, size, time duration, and flight path of the UFO were very similar. The object was flying at a great altitude, much higher than an airplane would. The UFO was quite large. A newspaper in Sichuan reported that a pilot from a local air force station flew next to the object and mistook it for an enemy fighter. Tian Xianyuan, an eyewitness and the assistant manager from Chongqing City’s Astronomy Center, was able to point out the object’s exact location (Chongqing, an independent municipality was formerly part of Sichuan Province). Some UFO sightings are nothing more than rockets launched from the Xichang Satellite Launch Center. For instance, in one case the UFO turned out to be a sounding rocket used to collect data about high energy and magnetic fields in the ionosphere. Perhaps UFOs, whatever their origin may be, are also interested in a very secret Chinese facility. What is known in the West as the Northwest Nuclear Weapons Research and Design Academy (also known as the “Ninth Academy”), was built by the Ninth Bureau of Chinese Nuclear Production Establishment in the early 1960s to produce China’s early nuclear bomb designs. In the late 1970s, the Ninth Academy also established a chemical industry institute to conduct experiments for reprocessing highly enriched uranium fuels. However, according to the official China news agency, Xinhua (July 20, 1995), the secret Ninth Academy was decommissioned in 1987, and the base was moved to other sites in Sichuan Province. 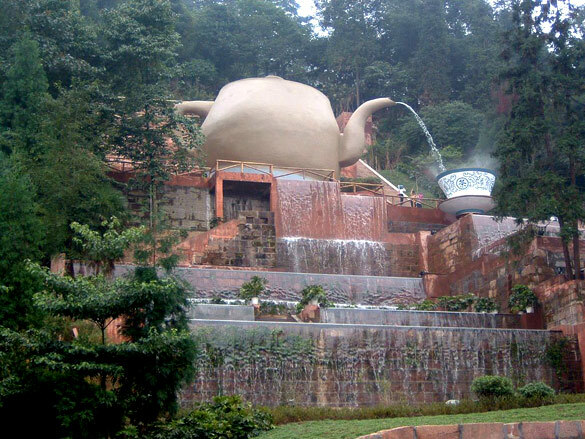 Mengding Mountain is the birthplace of tea civilization in China. Mengding tea is known in the country as “Tea of the Immortals.” For thousands of years the Chinese have enjoyed special tea varieties from the foggy peaks of the Mengding Mountain; the damp climate of the area is superb for growing tea. 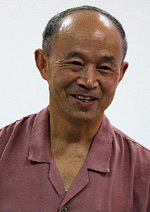 Xie Qiang is a scholar at the Beijing Research Institute of Mineral Resources. His hometown is Ya’an City, in the central part of Sichuan Province, in Mingshan County, on a tributary of the Min River. 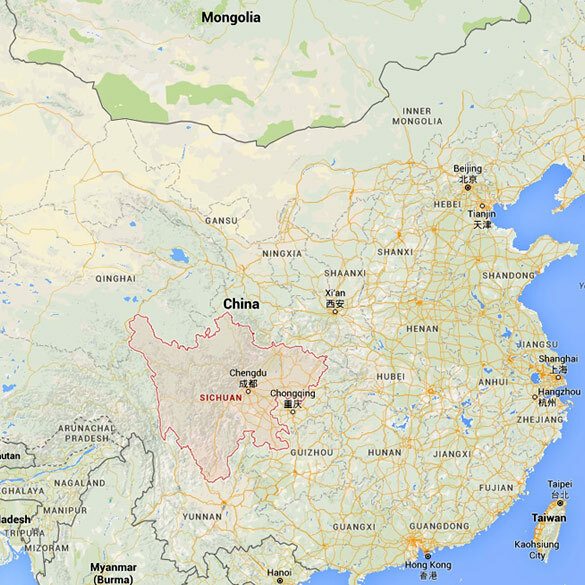 Qiang used Google satellite maps to locate his hometown and noticed something truly fascinating. 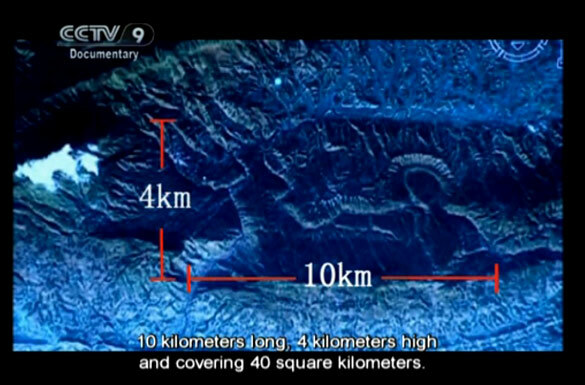 To the north of the city, in the Mengding Mountain area, Qiang observed a very unusual, huge image. It resembled a person, perhaps a warrior, wearing a crown of feathers or a helmet, with an animal next to him. The animal resembled Chinese mythical creature Qilin (Chinese version of unicorn with multiple horns). The size of the image is as follows: the length of 10 kilometers, and height of 4 kilometers (40 square kilometers). According to Qiang, the best position to appreciate this image is in the air 20 to 30 kilometers above the ground. The satellite map shows eyes, mouth, and nose on the face of the person. Along with the crown or helmet on his head, something that resembles a tunic is on the person’s shoulder of the right arm. A bracelet is visible on the arm. The left arm is bent at the elbow. To some people the warrior resembled a Roman soldier. The mysterious image points in the south-west direction. Who or what created it? Geological formations? Or did Human or humanoid builders create it? Perhaps, a meteorite impact generated it? The specific cause of its formation remains unknown. Xie Qiang was amazed, and decided to explore the discovery. In July, he and a geologist arrived in Ya’an City. They made their way to the Mengding Mountain, and reached the location of the warrior’s head. They found rivers in the area, and concluded that millions of years in the past the mountains were shaped by floods. One cannot see the image from the ground, due to its size. The story was reported in the Chengdu Evening Post, on March 3, 2008 and in a China Central Television special documentary in 2010. A powerful earthquake hit near Ya’an City in April of 2013 reportedly killing some 200 people. Because of its proximity to Lushan County, the epicenter of the magnitude-7 quake, Mengding Mountain has seen a lot of damage to many of its centuries-old buildings, which survived a magnitude-8 earthquake in the same province in 2008. There have been deadly earthquakes in the province in the recent years, and we do not know how the mysterious image of the Mengding Mountain has fared. Yuan Mei (1716–1797) was a successful official, a writer of how-to books for the civil service exams, a compiler and editor of volumes of supernatural tales, and a flourishing landscape artist; he has also been considered to be the greatest of all Chinese food writers and was an advocate of women’s education. Yuan embraced the spirit of Zen, but strongly rejected both folk Taoism and formalized Buddhism. As a boy, he was a talented student who earned his basic degree at the age of eleven. He received the highest academic degree at 23 and then went on to advanced studies. He eventually left public office and retired with his family to a private estate named “The Garden of Contentment.” Among other things, he also collected local ghost stories and published them. 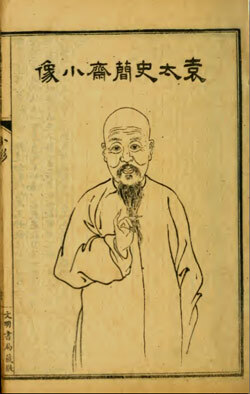 Ancient Chinese illustration of Yuan Mei. Yuan Mei traveled throughout China extensively, and thus, was able to collect its folklore. His book Censored by Confucius: Ghost Stories by Yuan Mei contained fascinating descriptions of paranormal creatures; some of them eerily resembling modern-day reports of aliens. Such was the description of the creature encountered in Sichuan Province by scholar Fei Mi and General Yang Zhan during their stay in the government facility said to be haunted by monsters. Neither the General nor his assistant Li believed in monsters, and they decided to spend the night upstairs (the reputed site of the haunting). Fei Mi was asked, or forced, to join them, but he was of a more suspicious nature, and took with him a lantern along with a sword. After the third watch that night a monster tiptoed upstairs. The description of the creature was as follows: it had a face but no eyebrows or eyes. It was lifeless and stiff, like deadwood. It had something of an eye in its back; it gave off a bright golden light. Apparently, it could direct the light at humans. Zhang Xiao-Po from Pinghu was sitting in his courtyard, and the sky was cloudless, All of a sudden he heard a cracking noise. There was a crevice in the sky and in the middle of it two eyes, resembling boats, with shiny pupils that emitted bright light; they were round like the axle of a cart. The entire courtyard was flooded by radiance. Much time had gone by before the eyes closed. Those who know, said that the sky opened its eyes (Yuan Mei, Noviye zapisi Xin Tsi Se ili o chyom ne govoril Konfutsiy, Zi Bu Yu, Moscow 1977). Our world is becoming smaller, and new technologies bring us together. Nations like Brazil, China, India and Russia will share more of their UFO history and research through the work of serious, dedicated people involved in the process. Countries like Israel, Poland, Japan, Chile, Ukraine, Mongolia, Indonesia, Kazakhstan, New Zealand and many more have experienced their own UFO sightings and fascinating cases. This is a worldwide phenomenon, and when the information about UFO — and unidentified submersible objects (USO) — sightings is exchanged and analyzed, we will certainly see patterns and similarities. Someone has been visiting our planet, its oceans, land, and skies since antiquity. And this visit, judging by continuous reports from all corners of the world, has not concluded. Paul Stonehill is the author of The Soviet UFO Files (1998), Paranormal Mysteries of Eurasia (2010), and co-author of several books with Philip Mantle.